Cautionary notice: these are BAKED doughnuts. If you are looking for fried doughnuts you will need to look elsewhere, sorry! Today is my last day in my job as a banking journalist. Yes, that's right, I am moving on from my first "proper" job, moving up a rung on the career ladder, seeking new pastures etc etc ad nauseum. I am actually feeling a little nauseous right now after the huge celebratory/commiseratory lunch I just had with some colleagues. But moving swiftly on - I decided to do one last bake for my colleagues. I'd been dying to make baked doughnuts again, so this time I experimented a little bit and used strong white bread flour instead of plain. 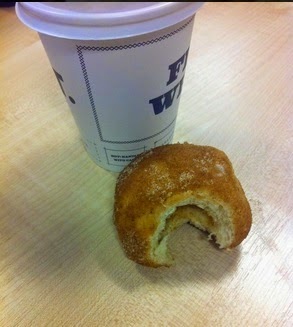 The results were variable - the doughnuts had a great texture - airy, light, yet chewy. But the dough was really hard to work, so they came out all kinds of shapes. Don't even try to talk to me about the ring doughnuts, I don't want to talk about them. I think next time I might try a cake doughnut that can be piped, because that way I will be certain to produce something that will work with my doughnut pan. Last time I made mini glazed ring doughnuts they were perfect, but I can't remember which recipe I used and I'm afraid I suspect it may have been an "Ellie special" i.e. completely made up. This recipe makes 24, 12 of each flavour. Don't panic if it looks like your dough is much smaller than mine - I was making 48 doughnuts - there are a lot of people in my office! 1. Sift the flour, 35g of the sugar and the yeast into a mixing bowl. Put half of the cinnamon and the sugar for the cinnamon doughnuts in a shallow bowl and set aside. 2. Put the milk and 15g of the butter in a pan and gently heat until butter is completed melted. Stir the dry ingredients until combined and make a well in the middle of the mixing bowl. 3. Pour in the milk, butter and beaten egg and mix with a spatula until it comes together into a loose, sticky ball. Lightly oil a clean surface and your hands and tip the dough onto the surface, then knead for 10 minutes until smooth and elastic. Put in a covered bowl and leave for 1 hour to rise until doubled in size. 4. When the dough has risen it will feel light and spongy. Punch it down and knead for 5 minutes. Grease a baking tray/your doughnut pan and roll the dough into 24 balls. Cover and leave for half an hour to an hour to prove, preheating the oven to 200C (180C if you have a fan oven) before they are ready to go in. 5. Bake the doughnuts for 8-10 minutes until golden brown. Cut a small hole in the side of each doughnut, then insert the (empty) icing syringe and wiggle it about a bit to make a cavity inside. Leave all doughnuts to cool, then set aside half of the doughnuts, preferably in an airtight box. 6. Fill the syringe with the creme patisserie and pipe the doughnuts full of it, then place these doughnuts on a cooling rack. Beat together the milk, vanilla icing sugar and brush this mixture over the doughnuts and leave to set. 7. Wash the syringe and brush, then take the doughnuts you set aside earlier. Beat the remaining cinnamon into the apple sauce, then fill the syringe with it and pipe doughnuts full of apple sauce. Melt the 35g butter in a small pan and brush over the doughnuts, then roll them in the cinnamon and sugar you set aside earlier. 8. Store in an airtight box in a cool place and eat as soon as possible. I still haven't got these quite right. Don't get me wrong - they're delicious. But they're also oddly shaped and very very hard to fill. Yesterday I was wondering if there was a way I could create a cavity in the doughnuts more successfully before I fill them. Does anyone have any suggestions? How do you fill your doughnuts?